This article is about the administrative body formed in 2000. For the similar body that existed until 1986, see Greater London Council. The Greater London Authority (GLA), also known as City Hall, is the devolved regional governance body of London, with jurisdiction over both counties of Greater London and the City of London. It consists of two political branches: the executive Mayoralty (currently led by Sadiq Khan) and the 25-member London Assembly, which serves as a means of checks and balances on the former. Since May 2016, both branches have been under the control of the London Labour Party. The authority was established in 2000, following a local referendum, and derives most of its powers from the Greater London Authority Act 1999 and the Greater London Authority Act 2007. It is a strategic regional authority, with powers over transport, policing, economic development, and fire and emergency planning. Three functional bodies — Transport for London, the Mayor's Office for Policing and Crime, and the London Fire Commissioner — are responsible for delivery of services in these areas. The planning policies of the Mayor of London are detailed in a statutory London Plan that is regularly updated and published. The Greater London Authority is mostly funded by direct government grant and it is also a precepting authority, with some money collected with local Council Tax. The GLA is unique in the British devolved and local government system, in terms of structure (it uses a presidential system-esque model), elections and selection of powers. The authority was established to replace a range of joint boards and quangos and provided an elected upper tier of local government in London for the first time since the abolition of the Greater London Council in 1986. The GLA is responsible for the strategic administration of the 1579 km² (610 sq. miles) of Greater London. It shares local government powers with the councils of 32 London boroughs and the City of London Corporation. It was created to improve the co-ordination between the local authorities in Greater London, and the Mayor of London's role is to give London a single person to represent it. The Mayor proposes policy and the GLA's budget, and makes appointments to the capital's strategic executive such as Transport for London. The primary purpose of the London Assembly is to hold the Mayor of London to account by scrutiny of his or her actions and decisions. The assembly must also accept or amend the Mayor's budget on an annual basis. The GLA is based at City Hall, a new building on the south bank of the River Thames, next to Tower Bridge. The GLA is different from the Corporation of the City of London with its largely ceremonial Lord Mayors, which controls only the Square Mile of the City, London's chief financial centre. In 1986, the Greater London Council was abolished by the Conservative government of Margaret Thatcher. Many people have surmised that the decision to abolish the GLC was made because of the existence of a high-spending left-wing Labour administration under Ken Livingstone, although pressure for the abolition of the GLC had arisen before Mr Livingstone took over, and was largely driven by the belief among the outer London Borough councils that they could perform the functions of the GLC just as well. On abolition, the strategic functions of the GLC were transferred to bodies controlled by central government or joint boards nominated by the London Borough councils. Some of the service delivery functions were transferred down to the councils themselves. For the next 14 years there was no single elected body for the whole of London. The Labour Party never supported the abolition of the GLC and made it a policy to re-establish some form of citywide elected authority. The Labour party adopted a policy of a single, directly elected Mayor (a policy first suggested by Tony Banks in 1990), together with an elected Assembly watching over the Mayor; this model, based on American cities, was partly aimed at making sure the new body resembled the erstwhile GLC as little as possible. After the Labour party won the 1997 general election, the policy was outlined in a White paper entitled A Mayor and Assembly for London (March 1998). Simultaneously with the elections to the London Borough councils, a referendum was held on the establishment of the GLA in May 1998, which was approved with 72% of the vote. The Greater London Authority Act 1999 passed through Parliament, receiving the Royal Assent in October 1999. In a controversial election campaign, the then Prime Minister, Tony Blair, attempted to block Livingstone's nomination and imposed his own candidate. In reaction, Livingstone stood as an independent candidate, resulting in his expulsion from the Labour Party and in March 2000, was elected as Mayor of London. 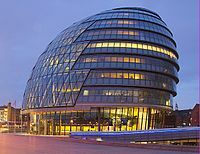 Following an interim period in which the Mayor and Assembly had been elected but had no powers, the GLA was formally established on 3 July 2000. Transport for London (TfL) – Responsible for managing most aspects of London's transport system, including public transport, main roads, and traffic management, and administering the London congestion charge. Mayor's Office for Policing and Crime – Responsible for overseeing the Metropolitan Police Service, which provides policing throughout Greater London. Replaced the Metropolitan Police Authority in January 2012 under the provisions of the Police Reform and Social Responsibility Act 2011. The London Fire Commissioner – Administers the London Fire Brigade and co-ordinates emergency planning. Until April 2017 this was the responsibility of the London Fire and Emergency Planning Authority (LFEPA). The London Legacy Development Corporation and Old Oak and Park Royal Development Corporation, which are Mayoral development corporations. Before April 2012 the London Development Agency (LDA) was responsible for development across London but was wound up following the Localism Act 2011. The London Legacy Development Corporation and Old Oak and Park Royal Development Corporation were set up using powers in the Localism Act to create Mayoral development corporations. In November 2005, the government published a consultation document reviewing the powers of the GLA, making proposals for additional powers, including waste management, planning, housing, and learning and skills. The result of the consultation and final proposals were published by the Department for Communities and Local Government on 13 July 2006. The GLA is responsible for co-ordinating land use planning in Greater London. The mayor produces a strategic plan, the "London Plan". The individual London Borough councils are legally bound to comply with the plan. The mayor has the power to over-ride planning decisions made by the London Boroughs if they are believed to be against the interests of London as a whole. As of 2006, London generates 42 million tonnes of carbon emissions per year, 7% of the UK's total. 44% of this comes from housing, 28% from commercial premises, 21% from transport, and 7% from industry. The Mayor's energy strategy planned to cut carbon emission levels by 20% by 2010 and 60% by 2050 (although achieving the first of these targets is unlikely). [needs update] Measures taken to achieve this have included the creation of the London Climate Change Agency, the London Energy Partnership and the founding of the international Large Cities Climate Leadership Group. The London Sustainable Development Commission has calculated that for housing to meet the 60% target, all new developments would have to be constructed to be carbon-neutral with immediate effect (using zero energy building techniques), in addition to cutting energy used in existing housing by 40%. After the 2016 elections, Labour has the largest representation on the GLA with the mayor as well as twelve assembly members, followed by eight from the Conservatives, two Greens, two UKIP, and one from the Liberal Democrats. ^ Zimmerman, Joseph (28 August 2003). "The Greater London Authority: Devolution or Administrative Decentralization?". Washington, DC: American Political Science Association: 6. ^ "Police Reform and Social Responsibility Act 2011 (Section 1)". UK Legislation. Retrieved 28 September 2011. ^ Toynbee, Polly (8 December 2005). "We can't allow these tin-pot dictators to ruin our capital". The Guardian. Retrieved 15 August 2017. ^ "London – planning for climate change", London Climate Change Agency. URL accessed 20 August 2006. ^ "Mayor's Energy Strategy", Mayor of London. URL accessed 20 August 2006. ^ "London planning for climate change". London Climate Change Agency Ltd. July 2006. Retrieved 15 August 2017. ^ "Results 2016". London Elects. Retrieved 15 August 2017.